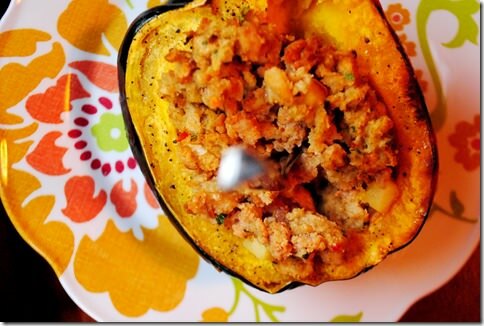 Stuffed Acorn Squash is a hearty and festive supper for a fall evening! 1. So I can eat all the glorious, olive oil brushed, prosciutto laced, cheese stuffed paninis from adorable, affordable, accessible new French places in town that I want! Some co-workers and I hit up Tartine…an adorable, affordable, accessible new French place in town…for lunch today, and the Prosciutto Panini I ordered was so crispy, I’m certain they heard my first bite down in Texas. I must know how they do this. These are the things that keep me up at night. 3. For my physical health. Gotta’ keep the ol’ ticker and other vital organs in tip top shape. 4. See #1. For my mental health. I’m not a running is cheaper than therapy! type person, but you can’t argue with a feel-good flow of endorphins brought on by a good sweat sesh. Self made medicine, for the win! Like tonight, for instance. Oooo, that sandwich at lunch was absolutely mouthwatering, but definitely heavier than what I usually devour around noon on a normal day. When 5pm rolled around I was absolutely dragging – feeling heavy and lethargic. The thought of hunching over the bathtub scrubbing my face in 5 hours, inevitably getting my hair, t-shirt and bathroom floor soaking wet, proved too much to bear though, and was just the push I needed to get out the door for a 4 mile run on the trail. It was slow, but it was good. And HOT! I don’t think I’ve told you, but we have been rocking 80 degree weather here all week. The Midwest likes to keep you on your toes like that. Despite the heat, I decided to turn the oven on tonight for dinner featuring a roasted delicacy – Double Stuffed Acorn Squash. I picked up a perky acorn squash at the Farmers’ Market last weekend, and knew exactly what I was going to be doing with it. 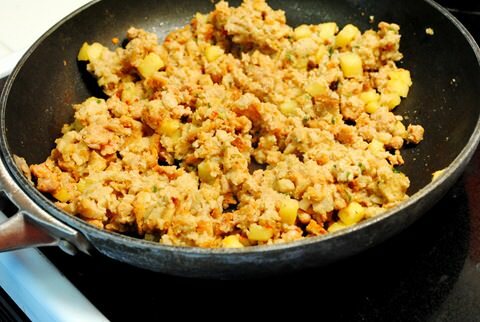 Stuffing it with spicy red wine & cheese infused chicken sausage, a chopped honeycrisp apple (that was hard to sacrifice) and some whole-wheat stuffing mix made moist and extra-flavorful with chicken broth. then popped under the broiler ’til it was golden brown. 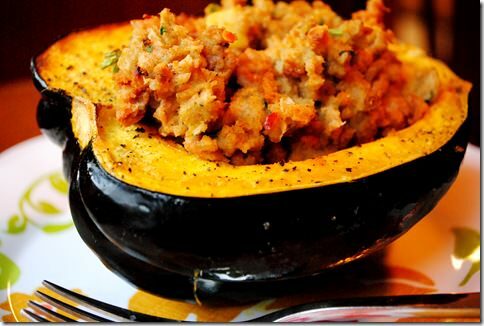 Each bite of this double stuffed squash – that is, squash stuffed with stuffing – was a new flavor experience. 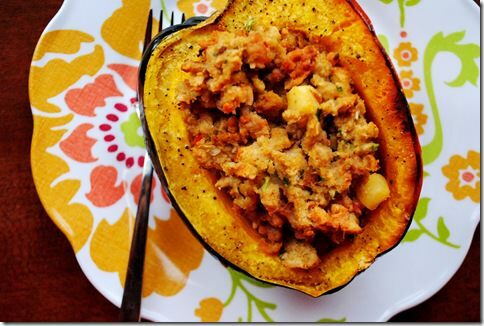 The squash was sweet, the apple tart, the sausage spicy and the stuffing savory. It was perfect! Preheat oven to 425 degrees. 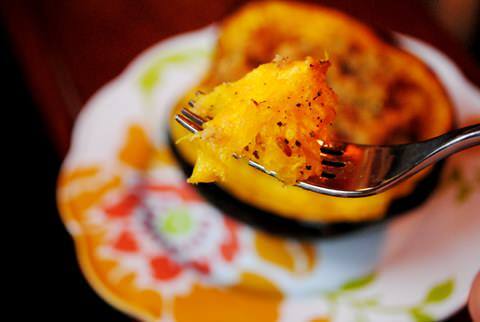 Pierce acorn squash several times with a knife, then place on a microwave-safe plate and cook for 2 minutes. 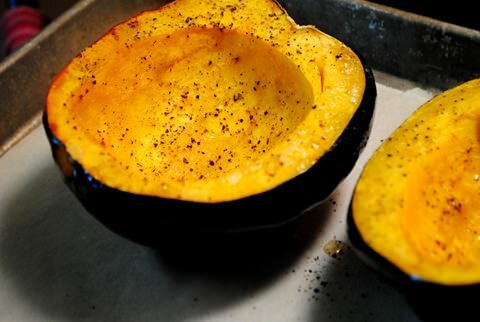 Cut the squash in half lengthwise, scoop out seeds, then microwave for 1 additional minute. Lay squash halves on a baking sheet, skin side down, then brush with extra virgin olive oil and season with salt and pepper. 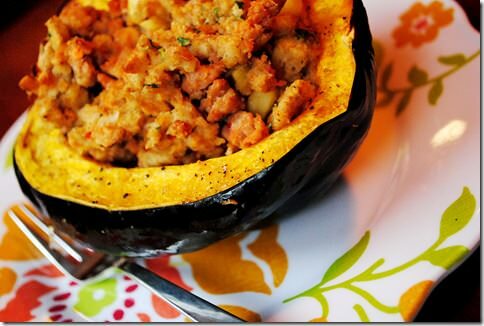 Bake for 25-30 minutes, or until a knife inserted into the thickest part of the squash goes in easily. 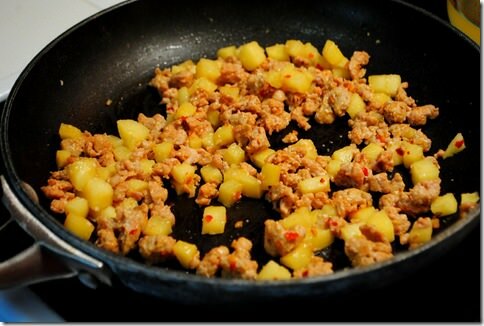 Meanwhile, in a skillet over medium-high heat, remove sausage from casing and sauté with apples until sausage is cooked through, breaking it up as it cooks. Turn the heat down to medium-low, and continue to cook until apples are soft but not mushy, ~3-4 more minutes. Add up to 1/4 cup chicken broth to keep apples from burning. 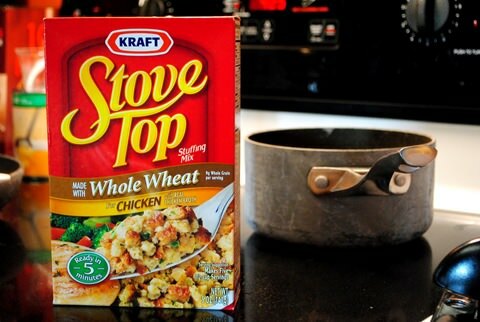 In a separate, small saucepan, bring 3/4 cup chicken broth to a boil. 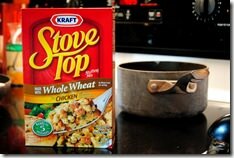 Pour in half the box of stuffing, stir, then place a lid on top and turn the heat off. 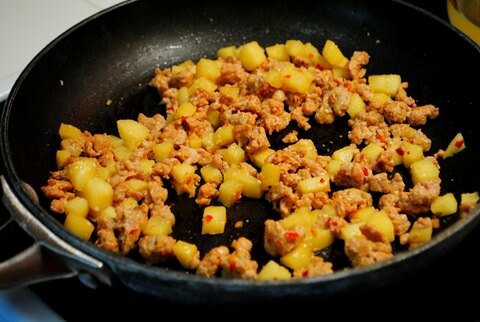 Allow the pan to sit for 5 minutes, then fluff stuffing with a fork. 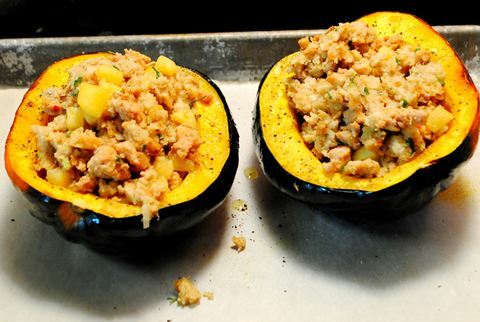 Combine stuffing with sausage & apple mixture then mound onto cooked acorn squash halves. Place under the broiler until stuffing is golden brown on top. This dinner was light, yet filling, and will make for some really great leftovers too. What is your #1 reason for working out? NEXT: IGE On Live TV! So I can eat a crap ton of food and wash it down with a beer. All great reasons… but esp #1! Haha, I love your reason for not washing your face at night. I work out every day mainly for my own sanity but also so I feel okay about eating whatever the hell I want. I could NEVER diet or count calories but I know i have enough motivation to get in a good workout every day. Plus I know how great I feel after every single one. Working out= wine w/o the guilt! Love the reasons! 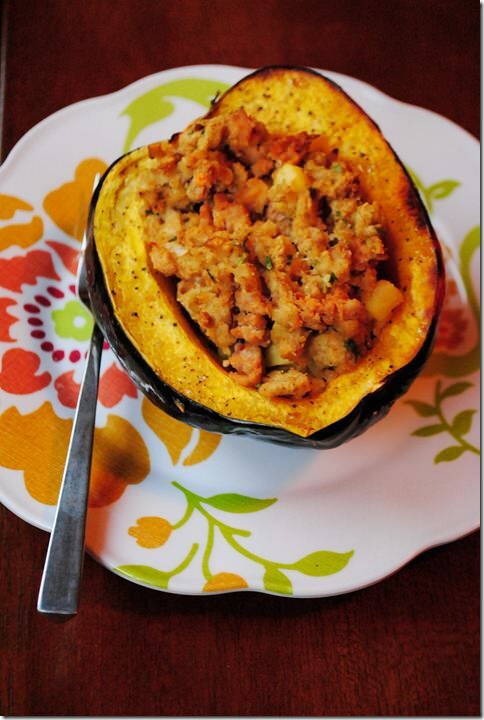 And, that acorn squash looks yummy… I picked one up this weekend and was trying to come up with a good recipe! Thanks for providing one! Oh dear. I am #4. But #1 for sure, too. 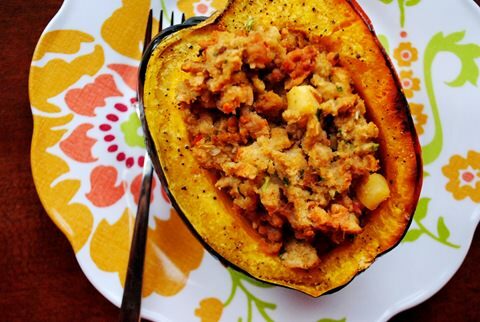 The squash looks delectable. I’m planning something similar with apples, caramelized onions, and sausage. YUM! I give you major credit for sacrificing a honeycrisp. I’ve got to go buy an granny smith or something for cooking. I have strict rules about honeycrisps. That squash looks amazing! I workout because I truly love it. I always have and have built my jobs around exercise. I was a personal trainer, aerobics instructor in the early to mid 90’s, and a PE teacher before becoming a SAHM. It’s so fun to get out there and move! I would recommend cutting the carbs at lunch to skip that mid-afternoon slump. It’s helped me tremendously. Hard to believe that the weather this week has been warmer than some days in Sept. It’s a beautiful fall in Iowa! #1 for sure! 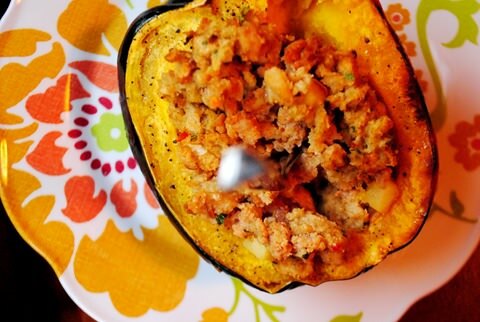 That squash recipe looks amazing- especially on a chilly, rainy day like today. Thanks for sharing! I’m new here (great blog. 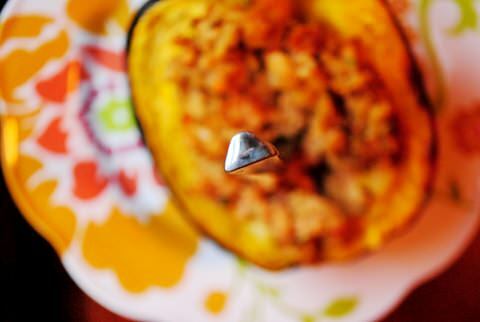 BTW) so I also wanted to say thanks for the awesome sounding squash recipe, it’s been added to the “TRY ME” list! my #1 reason is DEFINITELY dessert. 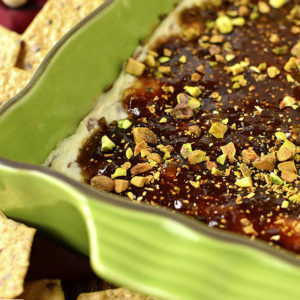 i eat a pretty indulgent dessert, guilt free, almost every night! bypassing a face wash, though, is up there! I TOTALLY agree with you about washing your face before bed…I love when I workout and take a shower at night…it makes my bed time ritual so much better! What a good idea! I usually just throw in a bunch of brown sugar and butter and cook mine for dessert. This sounds like a great change of pace!! I am so glad I am not the only one that drowns the bathroom and myself in the process of washing my face. I love working out for how it makes me feel! It makes me feel strong and empowered and GOOD. Also, is it thanksigivng time yet? Because I am now craving stuffing like woah! Washing your face before bed is the worst…especially in the winter when you’re cold and all you want to do is get snuggled into bed. I work out for my own sanity. I can definitely tell when I’ve had a few days in a row that are lacking in activity. I just don’t feel as great, mentally or physically. Mmmm, that looks fantastic! I am so with you on #5, it’s so great to be able to hop into bed all clean and fresh without having to pull on a headband (I have long hair) and get all soapy before bed. I workout simply b/c I love moving my body! I honestly feel restless if I haven’t worked out and am forced to sit most of the day. Sounds like Tartine was great — I’d JUST heard of it this week! For my health! Physical and mental :) I also like it when I can shower after a workout and wash my face so I don’t have to before bed! Exercise for me is MOST importantly definately for my mental clarity and self worth! You have to take care of you first before you can take care of those you love. A VERY close second would be all sweets!!!!!!!!! Lately for me that has been Lemon Tree! Holly buckets this frozen yogurt is to die for! Red velvet cake, carrot cake, chocolate, REESES PB cup, and many more flavors in the form of fro yo…..pure genius!!!!! Not to mention it is help yourself buffet style so ummmm……..PERFECTION!!!!!!! Shucks…..I think I may need to go there now!!!! First, I LOVE your blog. I wash my face over the tub otherwise the entire sink gets soaked. I have bad aim apparently! 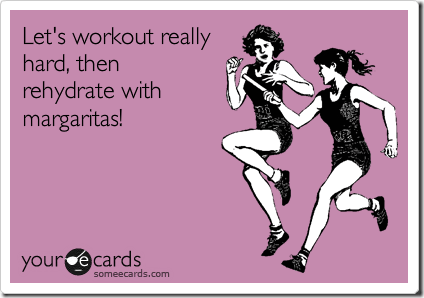 My #1 reason to workout is to try to keep up with your yummy mouthwatering recipes! I’m not even a squash person but dang it, you mesmerized me again! To eat cake and frosting — and any and all other sweets. It is a weakness so working out is a necessity. I started working after I started reading your blog- you made it sound so rewarding! Now I actually look forward to it. The stuffed squash looks (and Tartine sounds) amazing. Yum! I work out because if you don’t use it, you lose it and I want to be stronger in my old age! If I didn’t work out….I’d be 900 lbs!! It definitely keeps the weight in check. I definitely am with you on #1-#4, but honestly I LOVE washing my face at the end of the day! My number one reason for working out is to help with the stress of college life, and ofcourse helps so when I overindulge on the weekends:) that panini sounds amazing and the stuffed acorn squash looks so delicious! I like to exercise in the late afternoon as well. I also like showering after that because it makes mornings so easy. Added bonus – I don’t have to use that dang hair dryer and can let my hair air dry. So the Dr’s don’t yell! LOL! Seriously- my man and I are planning a long weekend and the thing we both get most excited about, more than the camping or sights is the new resteraunts we research before the trip! We send eachother emails with links saying things like “All vegetarian Indian place with fresh hot samsoas” or “check out the vegan velvet cake on this link, lets stop here! !” hehe….so we NEED to work out!! Ooo that sounds amazing! Great idea! Right now – my motivation for working out is to fit into and look awesome in my wedding dress. My general motivation for working out is to stay healthy, sane, and continue to eat like a young boy! I am SO with you! Love the recipe too! I go a little squash-crazy this time of year, and the husband will appreciate a little variety. My #1 reason for working out is my health. I also love the muscles I get, and the sense of accomplishment. I workout in the morning, though, so washing my face at night is a definite. I just keep a washcloth on the counter to wipe up any water I splash all over. 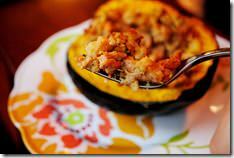 I have some acorn squash right now, and I have been trying to decide what to do with it. Definitely might try this recipe. My #1 reason for working out is that I like a good challenge. I try to push myself past the point where I am comfortable. I’m always looking to improve strength & endurance. i got super excited when i don’t have to wash my face before bed because i worked out and showered too! the simple things in life! Haha! I totally agree with all of your reasons but #5 is the best! I agree 100% with that. Am I the only one wondering why you wash your face in the tub and not the sink?? Because I always get the vanity soaking wet! I definitely agree with your reasons… I am very motivated by icing and cake. :) We must be on the same wavelength. 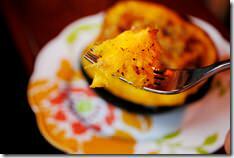 I wrote about stuffed acorn squash earlier today. So yummy!